Welcome to Day 5. Our guest blogger today is Beth from Delectably Free. A lifelong food lover, Beth recently adapted to an allergy-free diet, and even more recently to a mostly-vegan diet. 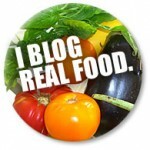 She strives to create delicious and healthy recipes on her blog, Delectably Free. Her goal is to create great food that demystifies allergy-free cooking and defies the belief that when you eliminate gluten, dairy, egg, sugar – and even meat – there is nothing left to eat. Just watching the promos for Jamie Oliver’s Food Revolution left me with an uncomfortable revelation: For the first time in two centuries, this generation of children is not expected to live as long as their parents. By now it’s no secret that junk food, fast food and sugary food have replaced wholesome family dinners and a balanced breakfast. But when parents’ life expectancies exceed their children’s, it’s apparent that our collective eating habits need a major overhaul. While American food these days is arguably worse than ever, unhealthy options have been a fixture in school lunches for as long as I can remember. When I was in elementary school, the school-lunch lineup consisted of foot-long hot dogs with tater tots, “Mexican pizza” (which was really just ground meat and cheese over bread), and sometimes corndogs. All were flavorless, nutrition-less, and, come to think of it, colorless. It’s sad to think that with such unhealthy options at schools, coming home is often no healthier. Blame jam-packed schedules and advertising campaigns that cater to our busy lives, and before you know it, opening up a can and heating its contents over the stove becomes dinner. I remember in college when I used to run home for a bite to eat between classes, a can of soup was often my go-to quick dinner – it was filling, cheap and fast. The one problem? It wasn’t usually healthy. With loads of sodium and little nutrition, most canned soups are a far cry from Mom’s homemade chicken noodle – if there still is such a thing. It’s said that to eat healthier, you should try to “eat the rainbow.” I’m not talking about Skittles, here. I’m talking about foods with color. Real foods. For example, red foods like tomato, red pepper and beets are high in lycopene, which may help to prevent several types of cancer. Green fruits and vegetables, such as leafy greens and broccoli, are high in vitamins such as folate. Avocado – also green – may help lower cholesterol and regulate blood pressure. Red lentils may help prevent clogging of the arteries and are great sources of iron and fiber (as are lentils in general). Compare the health benefits of these colorful vegetables with artery-clogging hot dogs, cheddar cheese and nutritionally-void white bread. I used to think that eating a variety of fruits and vegetables was by definition costly. In some ways, it can be. But this dish is proof that a healthy and colorful (not to mention super quick and easy) dinner need not exceed your budget. 1) Buy in bulk. The base of this soup is basically onion, garlic, olive oil, some spices, lentils, rice and water. The lentils and the rice were bought in bulk, making them a lot cheaper than pre-packaged option. Plus, I now have a good amount on hand so I can whip up this healthy soup when I’m short on cash or short on time. That way, I’m not tempted to order takeout. 2) Incorporate more expensive options into your dish, rather than making them the base of the dish. Just because avocados can be a bit pricey during certain times of the year doesn’t mean you can’t buy one and make it go far. Instead of buying several to make guacamole or an avocado salad, buy one, mix it with other vegetables, and use it to top a dish. The same goes for any other healthy ingredient that’s a bit over-budget. 3) Spice it up. When I’m looking to add flavor to a dish, I could either throw in more ingredients – which means more money – or simply add some spices, where a little goes a long way. This recipe calls for 2 teaspoons of chili powder and 1 teaspoon of cumin. This amount adds a lot of flavor, but barely puts a dent in my spice supply. If you like thick soups or chili, this is the soup for you. It’s also really simple to prepare. Next time you’re reaching for a can of high-sodium cream-of-something soup, remember this: this soup is no more difficult than throwing a few ingredients in a pot and stirring them occasionally. Since red lentils break down naturally during cooking, there is no need to puree or blend here. Try adding some cooked kidney beans to the soup at the end for an extra boost of fiber and color, or even some chopped, fresh greens. (I’m thinking kale, spinach or arugula might be nice.) Not into the avocado? Try making a fresh pico de gallo by dicing some onion, vine tomatoes, and jalapeños instead. For some other healthy, inexpensive and colorful meal ideas, try my roasted carrot salad or quinoa risotto – two of my favorite simple, homemade dinners. In a large soup pot or Dutch Oven, heat oil, onions and garlic over medium heat. Sauté for 5-6 minutes, or until soft and translucent. Add lentils, rice and spices and toss to coat with oil, about 1 minute. Add water and bring to a simmer. Then reduce to medium-low heat and cover. Let simmer for 35-40 minutes, or until lentils are broken down and rice is cooked through. Make sure to stir occasionally to prevent soup from burning on the bottom. Add more water as needed to keep desired consistency. Meanwhile, prepare avocado-tomato salsa. Toss all of the ingredients in a medium-sized bowl and add salt to taste. When rice has cooked through in the soup and when soup reaches desired consistency, remove from heat and stir in fresh lime juice. Add salt to taste. Ladle soup into bowls and top with a spoonful of fresh salsa. Serve immediately. And one last thing…Since this post falls on “National No-Phone Zone Day,” I kindly ask that you take a moment to sign Oprah’s pledge to make your car a “no phone zone.” Since you’re creating a healthier life for yourself in the kitchen, it would kind of defeat the purpose to put your life and others’ in jeopardy when you’re driving, right? Wow, another great post with wonderful photos, recipes, and tips! I would love some of that soup right now. (I often eat such meals for breakfast.) But, this would be great for lunch or dinner, too. The colors definitely draw you in and tell you that this combination is going to taste terrific. Your hints for saving money, while not compromising flavor, are also right on. It's so nice to meet you, Beth. Thanks so much for this post! Oh, and I love your thoughts and innovative brownie bar recipe over at your site, too! I've stopped eating canned soup a while ago. I also used to live on it because it was easy. But eventually it clicked… when you can't pronounce or understand half the ingredients, you know something's wrong!!! This soup looks tasty. 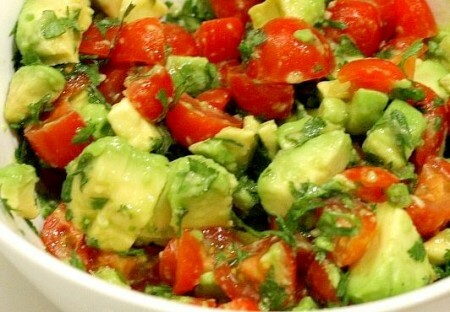 I especially want to try the Avocado and Tomato Salsa. Yum! YUM! that looks amazing. I love lentils and rice. Oh and avocados 🙂 Thanks for the great tips on buying in bulk. Love this recipe, can't wait to try it! I always buy in bulk to reduce my costs, so great tip too. You're making me hungry and its only 9:30am here! I love having soup for dinner so this is definitely on my list to try out. And I love avocado and will have to try the salsa as well. Thanks! This is a great tip and it looks like a great recipe! That is a beautiful looking soup. I think the soup is pretty amenable to variations, so if anyone makes it with a twist, and it turns out, let me know and I'll post the alteration to my site. Thanks again. This looks like a lovely soup, and a unique way to enjoy lentils! Yum! This looks great. Lentils make a great meal anytime so I'm glad to have another way to prepare them. Yummm sounds and looks very very tasty! Looks delicious! I love the idea of a fresh salsa on warm soup. This sounds wonderful. I love easy soup recipes. And I'm trying to reduce the amount of salt in my diet, so this recipe is an ideal way to do it. And the salsa – yum, yum, yum! And I love your idea of adding "color" to your diet. Thanks for the great post! I love lentils–and this contest! This is a fabulous and easy recipe. I have visited Beth's site previously and found it to be informative and full of fantasitc easy/healthy recipes. I would recommend the Stuffed Poblano Peppers they are a family favorite. Her Brownies are to die for!!! Do you think the soup would be good with brown lentils? my daughter would love this soup. I'll have to try it. I can't wait to try the Mexican lentil and rice soup. It sounds delicious! Another great recipe from "Iron Beth." I'll be making it tomorrow. Thanks for helping all of us in our quest to stay fit and healthy, while still enjoying "delectable" meals. Your #1 fan. I tried this soup yesterday and it was easy and delicious. Okay, it was a bit hot here and maybe soup wasn't the best choice, but every thought it was quite tasty. The salsa on top really kicked it up a notch! Thanks! Thanks again, all, for the great comments! Janette — very excited to hear that you made it an liked it! It's been a bit hot here the past few days as well…but at least it's something a bit lighter as we head into the warm weather (read: bathing suit) season, right? Thanks for the feedback! I think this is my dinner tonight or tomorrow! Wow! Might roast a couple sweet potatoes to have on the side. 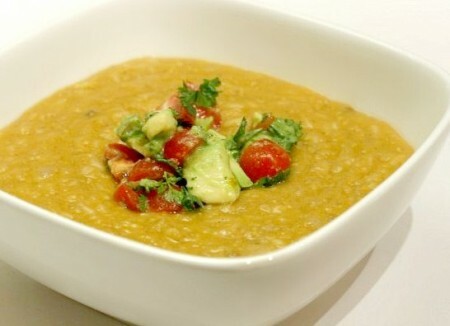 My kids like red lentil soup a lot, and I usually make it Indian-style. But they are fickle–one day they'll like it, the next they won't. Mixing it up a little will probably help. This looks delicious! I'm bookmarking this for a future rainy-day dinner. Thanks!